There are many ways to ride from Saigon to Dalat; from Vietnam’s biggest city to its most popular mountain retreat. Direct but busy routes along highways, scenic but indirect routes on quiet coastal and mountain roads, meandering back-road routes through farmland, and remote but challenging dirt road routes through jungle: the list is long and the combinations are endless. Which to choose depends on your time-scale, the purpose of your trip, and your level of motorbiking experience. Personally, I loath taking the main highways (QL1A and QL20). But, if you want to reach Dalat quickly, without taking the horrible highways, there are several great alternative routes. 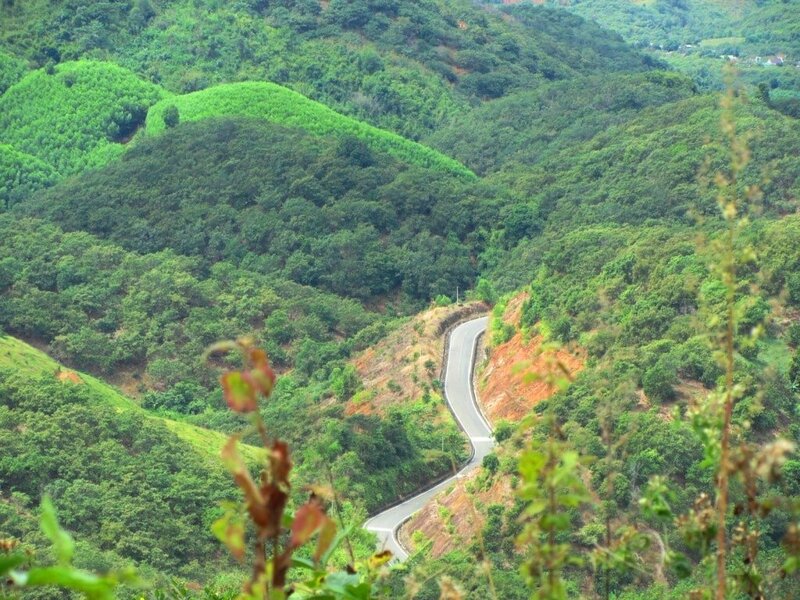 Using a combination of brand new (but empty) roads and old (but paved) back-roads, these routes offer relatively direct, traffic-free, and scenic ways to ride from Saigon to Dalat. In this guide I’ve outlined three ‘back ways’ from Saigon to Dalat. 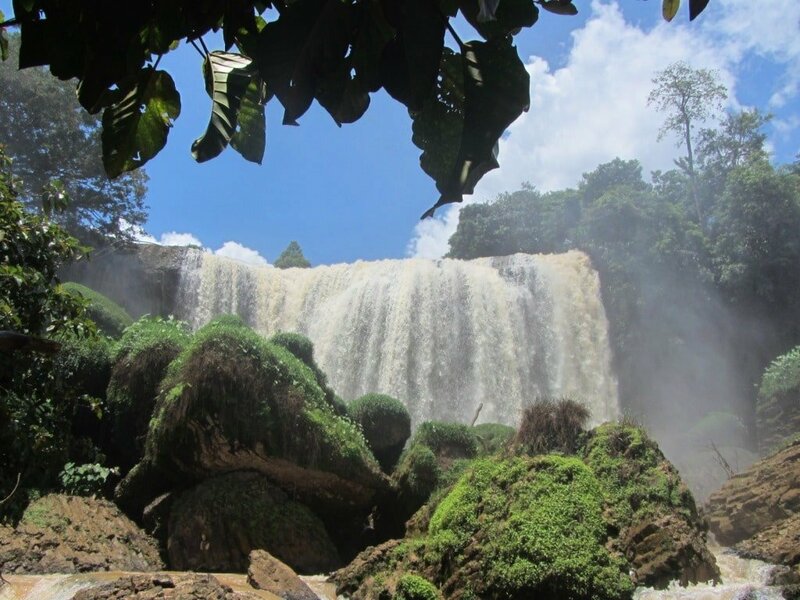 The main focus is to stay off busy roads and main highways as much as possible, while also being relatively direct and scenic ways to reach Dalat. In particular, I’ve concentrated on a 380km route (see the blue line on my map), but I’ve also included two variations of this route which are shorter: 360km (green line) and 310km (red line). 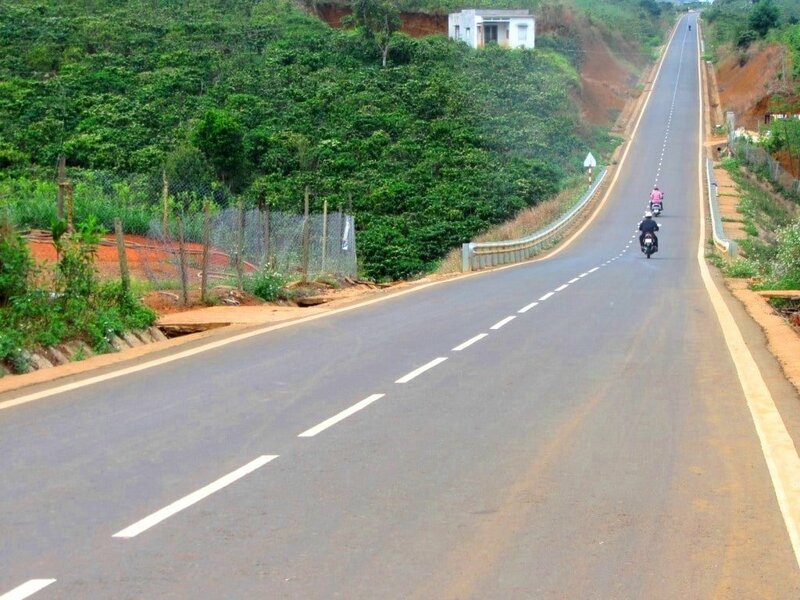 These are all slightly longer than taking the main highway from Saigon to Dalat (300km), but the roads are in great condition (except for a couple of rough patches), the scenery is good, the traffic is light; it’s safer, easier, more rewarding, cleaner, healthier, and a lot more fun, than taking the highways. All the routes are rideable in a day if you start early, or just break the journey along the way with a night in either Cat Tien, Bao Loc, or Di Linh (at Juliet’s Villa). I’ve included recommendations of places to stay along the way in my description of the route below. Head southeast out of Saigon towards the Cat Lai ferry. The short river crossing over muddy, wide waters, takes you to Dong Nai Province: you’re already out of Saigon. Off the ferry, follow Road DT769 all the way along its meandering course, through industrial suburbs, to Long Thanh. It’s not a pretty route, but the road is wide, the surface is new, and the riding is easy. Wind through the urban sprawl of Long Thanh on Le Duan and Ha Ba Trung streets, until you rejoin DT769 heading east. This is another freshly laid section of smooth road curving through industrial zones and vast rubber tree plantations. Bear left onto DT25, which wiggles all the way to Dau Giay, a notoriously busy intersection of Highway QL1A (Vietnam’s main artery) and Highway QL20 (the main road to Dalat). Turn right (due east) onto Highway QL1A for a mercifully short and easy stretch to Long Khanh. Route Update: DT25 can be busy with heavy goods vehicles: an alternative and quieter route goes via DT770 and QL56 to Long Khanh (see the red line on my map). This route has recently been repaved and is now my preferred way to go. Long Khanh is not a bad place to stop for a bite to eat and a coffee, before continuing east on the Xuan Loc-Long Khanh back-road. In excellent condition, this road follows the train line through lush farmland until it meets Road DT766. Turn left (due north) and follow this route (which turns into Road DT713) for 40km to just beyond Vo Xu. As you head further north on this road, the scenery gets greener, lusher, and brighter. Rice paddies glow in the sunshine, lotus lakes shimmer in the heat, eucalyptus trees line earthen dykes that divide the fields, and forested hills begin to appear on the horizon: the highlands are getting closer. After Vo Xu, it’s decision time: For the shortest route to Dalat, continue straight ahead on DT713 (see the red line); for the middle distance route to Dalat, bear right onto DT717 (see the green line); or for longest but most scenic and rewarding route to Dalat – and the one that this guide continues to follow – turn left (due west) onto a small road, sometimes marked ‘Đường Đa Kai’ (see the blue line). 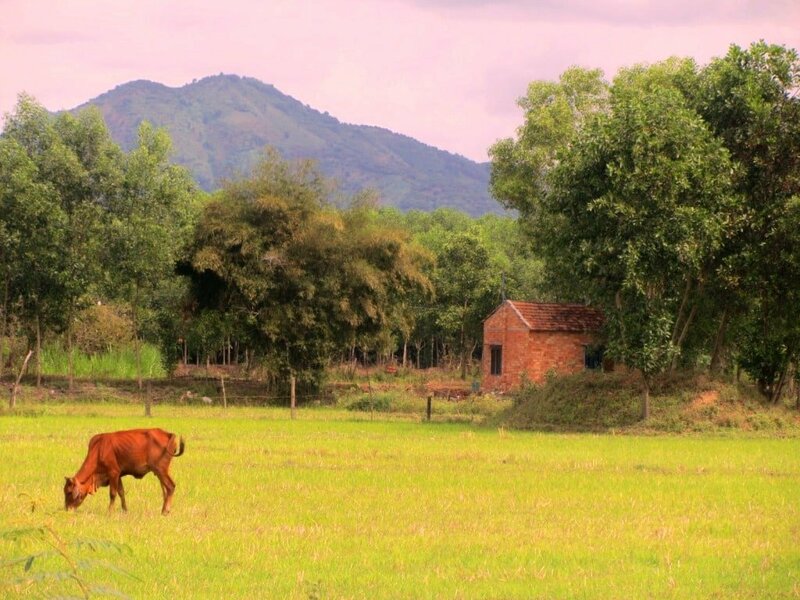 There are a few potholes but, with the hills to the north and wide-open spaces to the south, it’s a pleasant ride across to meet Highway QL20, at Phu Lam. Turn Right onto the highway for a brief stint up to Ma Da Gui. A nice place to stop for a drink and a snack, Ma Da Gui signals your arrival in the Central Highlands. If the daylight is fading, or you’ve had enough of riding for one day, take Road 600A (just south of Ma Da Gui) to the village of Nam Cat Tien for a night in one of the good accommodation options at Cat Tien National Park. Otherwise, bear left (due northwest) at Ma Da Gui onto a new and, as yet, unnamed road towards Da Teh (also signposted to Cat Tien). After passing through Da Teh, the road turns northwards and is marked DT725. The first half is a wonderfully smooth and curling section of brand new mountain road, winding up the hillsides, looking down over rivers, reservoirs, forests and farmland. Eventually, the road surface deteriorates and turns into a ‘normal’ road, but it’s still an easy ride: up several remote and twisting mountain passes, through bleak-looking minority villages, dusty coffee plantations, pine forests and deep, dark, dense jungle. There are a couple of local guest houses (nhà nghỉ) in Loc Bac if you need them. The road turns southeastwards and, after a while, passes by the politically and environmentally contentious bauxite (aluminium ore) mines near Bao Lam. The latter is a sizable town just north of Bao Loc. If you want to break the journey, head down to Bao Loc for a night at one of its comfortable and affordable hotels or guest houses, such as Ngoi Sao Lien Do Hotel, among others. Don’t miss the great coffee and mountain views at Photo & Bike Cafe, and a breakfast bowl of noodles at Phở Kết (376 Tran Phu Street). (Note: Bao Loc is also where the other two alternative routes meet – see the red and green lines on my map.) If you don’t need a break, continue east through Bao Lam on Le Duan Street and out the other side. The road, unnamed once again, bears northwest from Bao Lam and gets narrower, passing through an area of intense coffee farming. 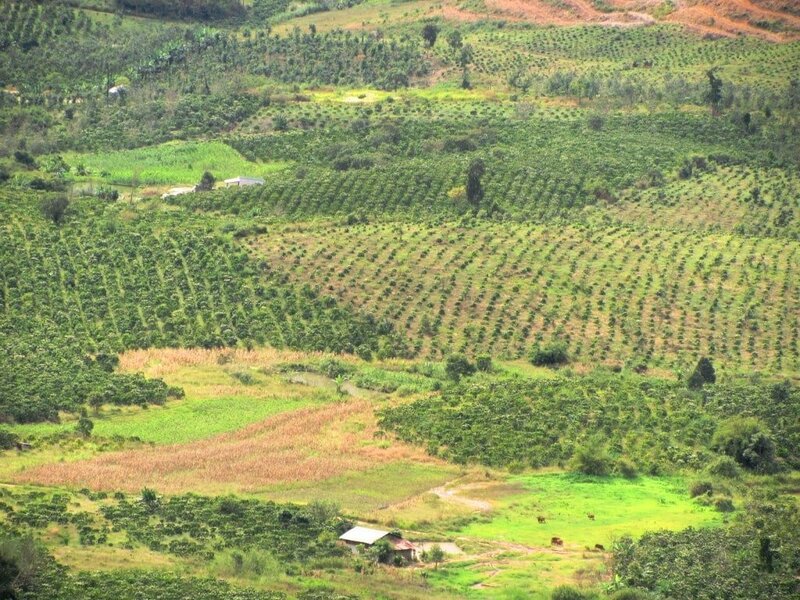 Because the forests have been cleared to make way for all the coffee bushes, there are no large trees – it’s a bald landscape – which means that the views are vast but fairly featureless. 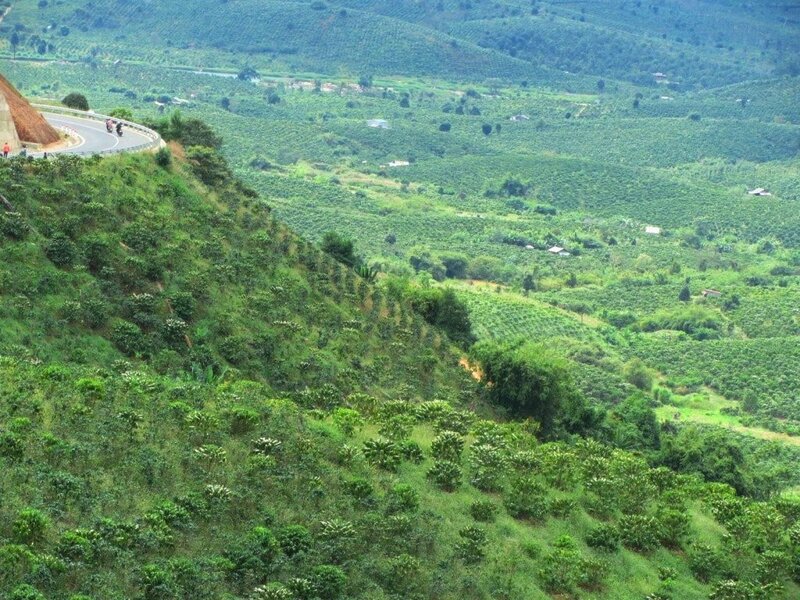 The air gets cooler as the road climbs higher onto the Di Linh Plateau. Depending on the season, this region is thick with either the nutty, earthy smell of drying coffee beans, or the sweet, jasmine-like aroma of coffee blossoms. It’s an empty, windy, invigorating ride all the way to the crossroads with QL28. If you’re running out of daylight hours, turn right (due south) on QL28 to Di Linh and find a guest house for the night on the main street, (or venture a little further from town for the excellent Juliet’s Villa Resort). If time is not an issue, continue straight over the crossroads, heading east. The first section of this road (unnamed, once again) is superb. There are several reasons for this, but first among them is the sheer riding pleasure. The asphalt is newly laid; treacle black and perfectly smooth. It’s essentially a motorcycle course in the mountains: a blend of long straights, hairpin bends, and meandering chicanes. The scenery is big: impressive for its scale and scope, if not for its natural beauty. Coffee bushes dominate the scene: it’s easy to see how Vietnam has become, in just over a generation, the second largest producer and exporter of coffee in the world. The road snakes off into the distance, up and down mountains, through valleys, bisecting the endless coffee plantations that appear to stretch westwards all the way to the Cambodian border. The tarmac bends and curls, and climbs and descends over the big, barren landscape, like a gigantic, black serpent, wriggling across the Central Highlands. After a while, the new road ends and the condition of the second half of the route, up to the junction with QL27 at Lam Ha, is only OK, so watch out for some potholes. At Lam Ha, turn right (due east) onto Road QL27 and follow it for a few minutes before turning left (due north) onto an unmarked road towards Ta Nung Village. The Central Highlands is famous for its agricultural produce, so it’s no surprise that the landscape here is heavily farmed. It’s fun to try to identify as many crops as you can as you ride through this region: fruits, vegetables, and flowers of all varieties – some familiar, some strange and exotic – grow in abundance. Don’t forget to stop for a quick look at Elephant Waterfall, on your left, before reaching Ta Nung Village. *Please support Vietnam Coracle: I never write a post for money: all my content is free and all my guides are independent. You can support the work I do by booking your hotels via the Agoda links on my site, like the ones on this page. If you make a booking, I receive a small commission (at no extra cost to you). Any money I make goes straight back into this site. Thank you. 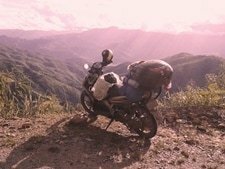 This entry was posted in ALL, Central, Dalat Motorbike Routes, MOTORBIKE GUIDES, Mountains, The South and tagged back roads, best route, central highlands, Dalat, guide, highway, motorbike, road trip, Saigon, Vietnam. Bookmark the permalink. 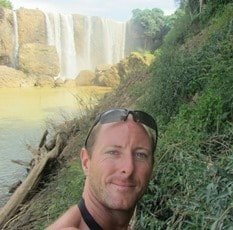 Hi Tom, do you or anyone else here know if it’s possible to ride the motorbike just one-way from Saigon to Dalat, and then send the motorbike back to Saigon on the train? Whoops, it occurred to me that because there is no rail service to Dalat, that would be impossible. I’ve heard it’s also possible to send a motorbike by bus. Do you know anything about that? There are some buslines that can transport the bike for you, but I’m not certain which they are – try Googling that. Also, if you’re renting your bike from one of these recommended companies, they might be able to arrange you dropping the bike in Dalat. There’s no train between Dalat and Saigon, so that’s not possible. Fantastic page! Reading through this site has been a great help for our upcoming motorcycle journey from HCM to Hanoi. 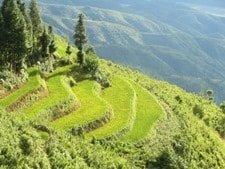 While you’ve mentioned this particular route from Saigon to Dalat can be completed within a day, would you recommend it considering the distance of nearly 400kms? Assuming average weather conditions (big assumption haha) and the like, how long would the blue route take for a days journey? Also, as this article was first published 2 years ago, do you know if there have been any big changes to the routes above? If you wanted to complete the blue route in one day you would have to leave very early in the morning and expect to finish after dark – it is long and tiring, but if you have lots of experience riding in Vietnam then it is doable in a long day. However, it’s much more enjoyable to take at least 2 days/one night for the blue route. You could stop over night is Cat Tien National Park, or Bao Loc, or Di Linh (maybe Juliet’s Villa), for example. Great website and some very useful guides you’ve put together. I’m planning on doing a Saigon-Bao Loc-Saigon loop this January. I’m unsure how far I’ll be able to go in a day and was hoping you could share some advice. E.g. on day 1 coming out of Saigon what’s a reasonable distance to plan with? I’d prefer to only ride during daylight. I’ll be on a rented scooter and will stick to back roads. 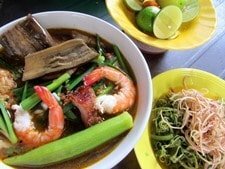 Also, suggestions for good places to rent scooters in Saigon would be appreciated. For my advice on bike rental companies see this. You can ride Saigon to Bao Loc in one day quite comfortably, even on back-roads, if you start in the morning. Personally, I would recommend mixing some of the roads and routes in the guide above with parts of this guide and this guide. 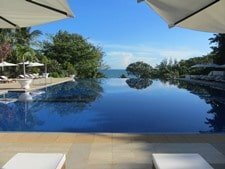 You could even finish the loop in Phan Thiet instead, then travel by train with your bike back to Saigon – more here. Thanks for a quick and very helpful response! I look forward to hitting the roads! Some friends and I going to ride part of this route over the coming weekend. 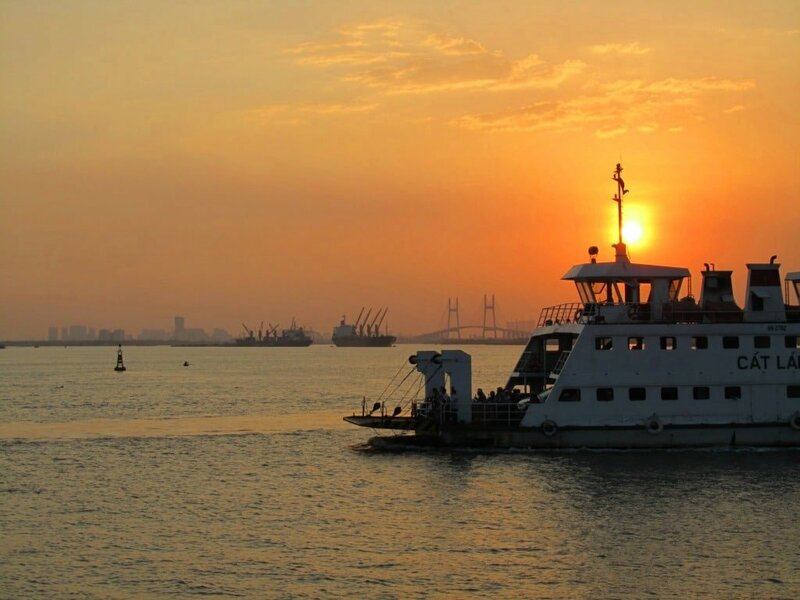 We’re thinking of leaving after work on Friday and heading for Long Khanh to stay overnight. I’ve seen there are a few hotels there, but do you have any recommendations? It’s been a while since I last stayed in Long Khanh so I can’t recommend a specific place, but I remember there were several mini-hotels and local guest houses there to choose from and it was fine for a night. I would like to follow the blue route + avoid highway. But in Google maps, I’m not able to use the blue route. When I’m starting the route form HCMC to cattien, it goes another route. How can I use your route? To follow my route on Google Maps you need to export my map to KML and then upload the KML file to Maps.me app on your phone. Tomorrow we are riding from Bao Loc to our accomodation about 40 minutes south of nha trang. (Not going thru Da Lat). Haven you ridden this way before? It looks like QL20 and QL27 are the main roads. Glad you enjoyed the ride today. It depends where exactly your accommodation is – there are a few different routes to take. But QL20 and QL27 are very good – they’ve been resurfaced recently so they’re in good condition and pass good scenery too. Thanks Tom for your quick reply. Bao Loc is gorgeous. So glad we opted for this way instead of Mui Ne! We are staying in the Cam Lam district, between Cam Ranh and Nha Trang. QL27, QL27B or DT656. Thoughts? At the Tan Son junction (which is where you’ll need to choose which of those three roads to take), I would suggest taking either QL27B or DT656, because QL27 gets increasingly busy and boring the closer you get to Thap Cham. Of the two, the quickest road is QL27B which is good and scenic (I’ve written about it here), but DT656 is longer and more scenic, especially the first 30km along the river and the last 20km down from the mountains to the coast (I’ve written about it here). Having been referred to your great article, I cycled, unsupported, with a friend from District 2 in Saigon to Dalat last weekend, following the course of your Blue Route. I have to say it was a fantastic ride, although quite tough on a bicycle. We covered about 250km on the first day, sleeping in a guesthouse in Loc Bac on Saturday night. On the Sunday, fuelled by Pho and Banh Mi, we climbed up to Dalat, another 150km. So, 400km for the whole ride and some amazing scenery. Would highly recommend this route to other cyclists. Thanks again for the inspiration to do this. I hope you get the chance to do more scenic cycle rides in Vietnam soon. I wonder if you could share anymore info on the green route to Bao Loc. We have done the DT725 a few times now but wondered about the scenery and conditions of the road on the green route. The green route is good: QL55 is a fantastic road – the majority is in excellent condition, but there are patches as you get closer to Bao Loc that are a bit rough. If you ride this route and have any updates after, please do leave a comment here so that only readers can benefit. What a wonderful website with great information. We just arrived at the Ket Tien national park. We are staying at the Green Hope Lodge, unfortunately we weren’t able to book the lodge through the links provided on your website. We will be traveling to Da Lat tomorrow and here the same problem occurs when trying to book through your website. Regarding the roads, we took the red line when we came of the ferry and all was perfect. The roads have been perfect all the way up to Ket Tein National Park. We have only encountered a shore bottom from the today’s trip. But that was for sure not due to the roads. 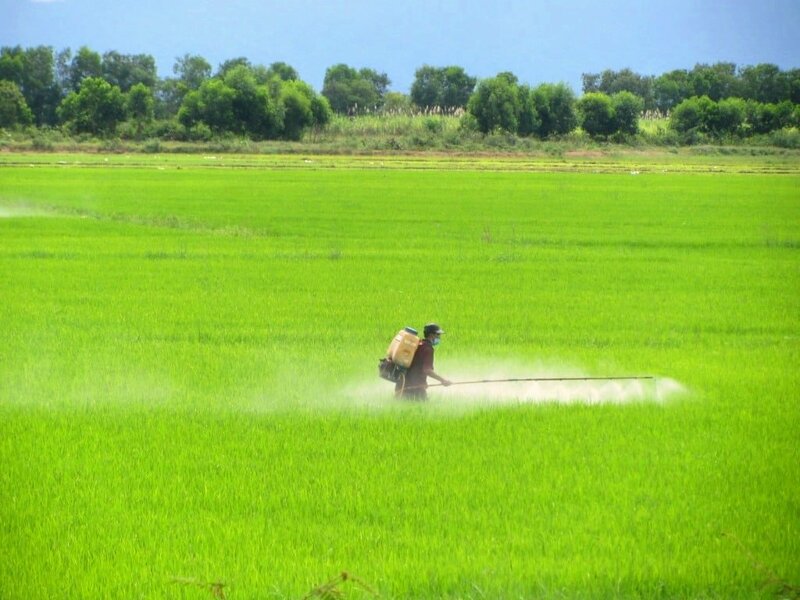 We will be traveling all the way up to above Hanoi and will likely use lots of your trips. We will update you one the quality of the roads. Thanks for you website and all the help it has given us already. Thanks. Good to hear the roads have been OK so far. I hope you continue to enjoy your trip. Please do send me any more updates as you continue. Can you tell me what the problem is with booking through my site? Then I can try to fix it. When I tried to book through your website I was redirected to https://www.reviewmaster.com. But I checked it again today and booking is possible again with Agoda. The roads out of Cat Tien National Park were amazing. The owner of green hope lodge gave us a tip for a shortcut. When driving away from green hope after about 5 minutes there is a hidden turn to your left. It is in between some shops on the main road. This turn will lead you to a beautiful bridge and amazing scenery. It will connect to the blue line and safe you about 20 minutes of driving. The roads were at times a little bumpy. But for the most part we have enjoyed great roads with little traffic. We especially loved the new roads just after the bridge after QL 28. We are currently in Dalat and plan on driving to Hoi An. Is there any road you would recommend? Right now we are looking at the Coast Road or connecting to section 2 of the Ho Chi Minh Road. I see. Thanks for letting me know the booking problem. If that happens again usually all you have to do is reload the page and try again then it should work. Good to hear the roads are still scenic. Yes, I took that shortcut last time I was in Cat Tien – very nice indeed. From Dalat to Hoi An you could either follow my Truong Son Dong Road guide through the mountains and then hit the coast, or head down from Dalat to Nha Trang on road QL27C and then follow my Coast Road guide up to Hoi An. Both routes are very scenic. Hey Tom! We leave from Ho Chi Minh City to Cat Tien National Park in the morning. We are very interested in the blue route! I have your route on google maps but is there a way to have google maps follow this route with directions? Or do I just have to wing it by following your blue line? We just rode down to Can Tho and it was all on QL1A.. Which needless to say made for a terrible ride. We are exploring all of Vietnam by motorbike. We are looking for back/scenic roads and this site has been amazing! You can export my map from Google (Export to KML option in the drop down menu, top left of the map) and upload it to maps.me, then you should be able to follow it according to your gps location. A recent update – the first half of the red route after Vo Xu is full of potholes. Avoid the route at any cost. Thanks for the update. I was on that road a few months ago and experienced regular potholes for a few kilometres before the pass, but after that they were fairly infrequent, and I didn’t find it bad enough to avoid the route. Perhaps it’s changed since then, especially with all the rain recently. Update on this rode. Still some potholes. But big part is underconstruction now, seems like it will be a two lane street im the futures. It is not closed for traffic, during construction. Thanks, but which road are you referring to? Thanks a lot for all the guides. Thought I’d give you an update that I drove the route that was marked in red to Long Khanh, and there is no longer any construction along that route. The roads were really wide and new and not particularly busy! Thanks a lot for the update – that’s great information. My girlfriend and I are big fans of your website and find your tips and advice very helpful! We are planning to follow the the blue route you suggest. We are planning to to ride to Cat Tien, stay the night and then continue to Da Lat for 2 days. And then ride back, once again staying in Cat Tien to break up the trip. However, we would be riding worn Yamaha Nouvo’s. We will have basic maintenance done but do you think they would be still Ok for this route or do you think that a semi-automatic is a must? As well, We have only been driving in the city for a few months and while we are pretty comfortable, , we have not yet attempted a trip like this. DO you have any tips/advice/suggestions about riding outside the city / Cat tien or Da Lat? Yes, your ‘worn’ Nouvos should be fine for this route. But do make sure you get them looked at before you go – technical hitches on the road can ruin a road trip, especially when you have limited time. 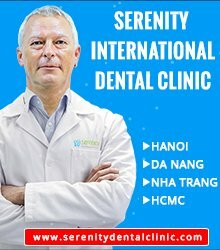 Regards experience, in general you should be fine if you have already been riding in Saigon for some time. But remember to be very careful nonetheless. The first hour out of Saigon is always a bit busy and dusty – that’s just the way it is, no matter which route you take. After that, the roads are in pretty good condition for around 80% of the route. However, there are bumpy sections every now and then: in particular, there is a section of about 10-20km of rough road (it’s being resurfaced) before the junction with QL27 – so watch out for this. Thank you for the feedback John! It’s very informative! Hey Tom. I am curious, from the US and my phone is locked so I cannot have a sim. I would really like to be able to save your route to follow on the road, but when i download the area offline the route disappears. I am worried that for instance from Saigon to dalat I will lose the route. Any tips on how to achieve this goal? Your site is amazing. You could try to get a local sim card – it’s not that difficult to find one if you go to a cell phone shop. But the issue might not be your phone – Google Maps offline tends not to work in Vietnam. This is an issue which I am trying to address by creating a Vietnam Coracle map app, but it is still a long way from completion. So for now, you can try exporting my Google Maps to maps.me or openstreetmaps – that should work offline. We took the long route between ho chi Minh and da lat as you advised and what a journey it was. Breath taking views to start our adventure, your whole site regards to food etc as well has been so helpful and we feel we are seeing the real Vietnam. Can’t wait to adventure more north but for now we are having a few days in da lat. Thanks, great to hear that. 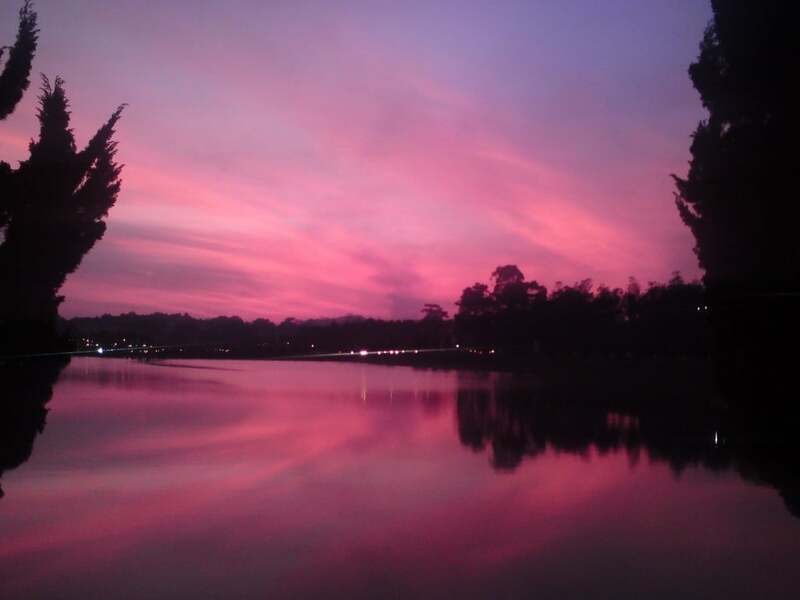 I hope you enjoy the mountain air in Dalat for a few days. Tom – thank you for this article! We will be doing the reverse trip in April; Dalat – Juliets Villa – Cat Tien (Green Bamboo) – Saigon and was unsure about QL20. We will definitely altering our route now to ride most of the blue route. That sounds like a good trip. Yes, it will be a much more pleasant ride without using QL20. I hope you enjoy it. I live in Dalat and have only ever taken highways 1 & 20 ’cause I always think I’m in a hurry. Next trip to Saigon, I’m taking the blue route. Thanks for another wonderful and informative post. That’s great. I hope you enjoy it. 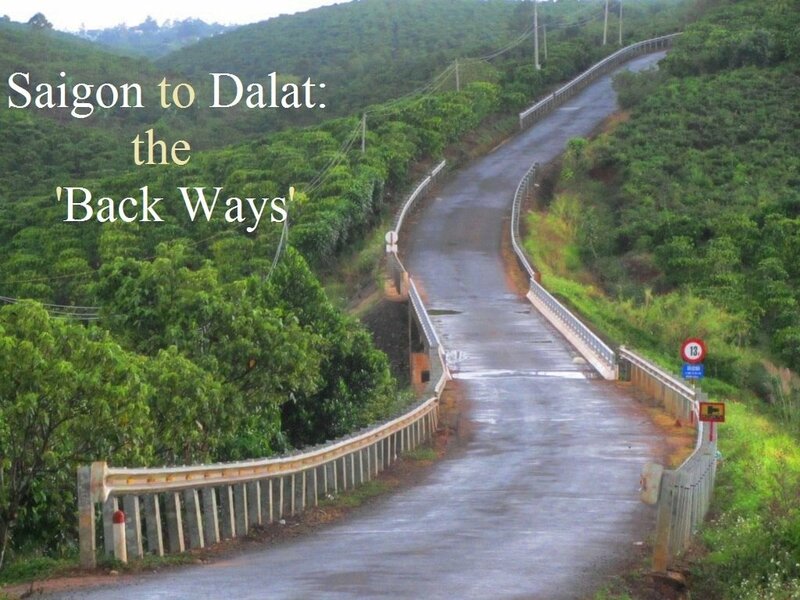 I know, me too – I used to avoid going to Dalat because I hated Highway 20 so much, but the ‘back-ways’ are so much nicer. The blue route is a little longer of course, but for me it’s really worth it.